Shoveling snow can provide good exercise when done correctly but can prove harmful if people try to take on more than they can handle or use faulty techniques. • If you're inactive and have a history of heart trouble, talk to your doctor ... stop if you feel tightness in your chest. Heart attacks increase significantly in the winter months, particularly while people are shoveling snow. • Drink plenty of water. Dehydration is just as possible when you exert yourself in cold winter months as it is in the summer. • Warm up your muscles in your arms and legs. 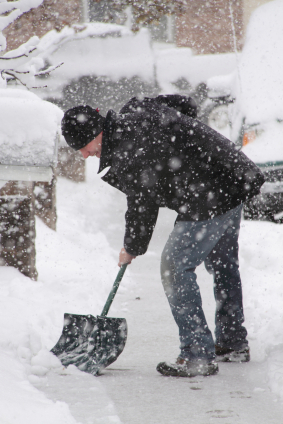 Walk for a few minutes and stretch your arms and legs before shoveling. Warm muscles are less likely to be injured and work more efficiently. • Take it slow! Pace yourself and take breaks. Keep a cell phone handy in case of emergency. • Don’t pick up too much snow at once. Use a small shovel, or fill it only one-fourth to one-half if you use a large shovel. If necessary, just push the snow as you shovel. It is easier on your back. Keep the load of snow as close to you as possible. • Protect your back. Bend from the knees, not your back. Lift with your legs bent, stand with your feet about hip width for balance and keep the shovel close to your body. Try not to twist. If you move the snow to one side move your feet to face the direction the snow will be going. • Clear snow as soon as it stops falling. Freshly fallen snow is lighter. • Most importantly – listen to your body! Stop if you feel tired.